Hollywood & Highland Up High, originally uploaded by Atwater Village Newbie. 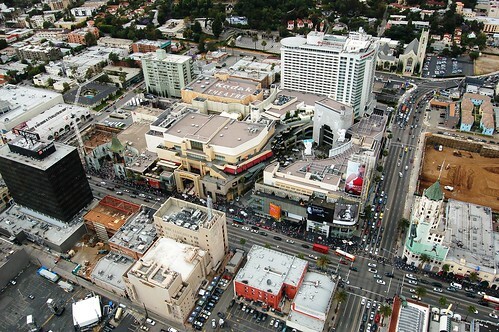 AS PART OF our helicopter tour last weekend, the pilot did a loop around the famous (or, depending on your point of view, infamous) intersection and mall known as Hollywood & Highland. While this corner arguably houses the ugliest building in Los Angeles, on this day it was hopping. In fact, for viewing hordes of humanity from a helicopter, Hollywood & Highland rivaled even the beaches and Santa Monica Pier. Enjoy my 24-photo Flickr set. Price: $195K, Adjusted Net: $50K-60K. Be one of the few to get involved in a great franchise. 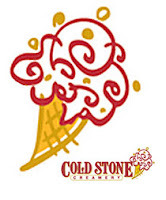 Cold Stone Creamery is a growing concept with stores opening worldwide. We are the best premium ice cream concept out there. We make all our ice creams in our stores. We started carrying a line of shakes and smoothies. We will soon have a soft serve treat called Tartberry. This location has a lot of potential. It has not been marketed very well. 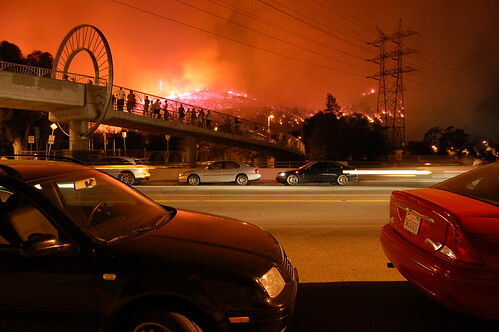 It is near Los Feliz, Silver Lake and Glendale. MEMORIAL DAY NEWS as reported by CityWatch: "Councilman Tom LaBonge and fellow Angelinos [sic] honored the nation's veterans by noting the American flags raised along the landmark Hyperion Bridge... LaBonge allocated about $2,000 for the installation of 30 flags along the historic bridge through revenue generated by advertising on transit benches and kiosks in the Fourth Council District. The flags will fly in commemoration of the Fourth of July and September 11th and will remain in place until September 28, 2008." New Ferris Wheel at Santa Monica Pier? 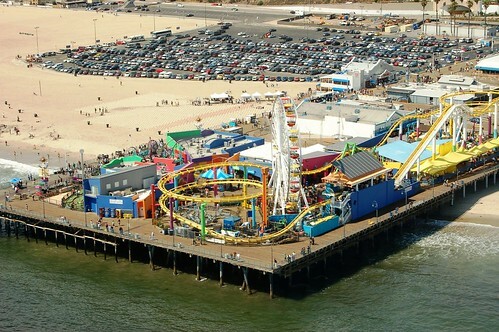 Pier Amusement Park, originally uploaded by Atwater Village Newbie. WE FLEW PAST Santa Monica Pier on our Los Angeles helicopter tour this weekend. We can only assume that this big white ferris wheel is the new one, to be unveiled tomorrow night, and not the old one, purchased on eBay for $132,400. 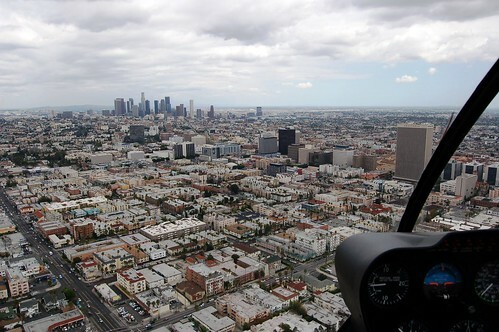 Adventure Helicopter Tours of LA flew a 4-seater with panoramic views. Not a bad seat in the house for this $480 tour. And Mrs. Newbie graciously allowed her photographer to sit up front. Photos are being sifted, sorted and shared - soon. Way to Spend an Afternoon, originally uploaded by Atwater Village Newbie. IT WAS AN anniversary gift from Mrs. Newbie, a perfect way for us to celebrate our new hometown. In just 40 minutes this afternoon, in ideal sight-seeing weather, I snapped some 800 photographs. The better ones will be posted here. Stay tuned. SOMETIME YESTERDAY the switches were flipped, the signs updated. All 5 gas stations in Atwater Village crossed the $4 per gallon threshold, with the always overpriced Gas Mart on Glendale Blvd. topping off the competition at $4.15/gallon for regular unleaded. Stuffed but Still Game, originally uploaded by faustfatale. PREPARE TO GET hungry, no matter what time of day, when you read Eric Stone's account of his taco-truck adventure earlier this month. His seventh, and unplanned, stop: the off-the-hook taco stand on Fletcher Drive in what he calls Silver Lake, but is known in these parts as Atwater Village. "...Along the way we had to pass my favorite taco cart in Christa and my neighborhood (Silverlake) - the al pastor wheel at Fletcher and Larga, across from the U-Haul. It wasn't in us to simply drive by. So we finished off the night there, with excellent al pastor and what might be my favorite salsa roja in town - a bit thinner than most, but with a good, solid bite and a nice tickle of vinegar." 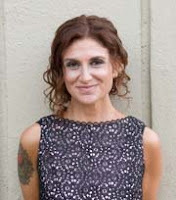 She lives in the LA neighborhood of Atwater Village with her husband Rich and their two dogs Buddy and Bosco. What was perhaps her bravest local report came from the "All You Can Eat" seats at Dodger Stadium. BUT TOO NOISY to sleep with them open. What was going on at 4:00 this morning? A ghetto bird circled the neighborhood about 30 times. It looked like the helicopter spotlight was shining near the Glendale-Hyperion bridge. SAVE YOURSELF the haul to Van Nuys, stroller pushers, because Babies "R" Us is opening soon between Toys "R" Us and Costco in Atwater Village. It's a good thing, too, because I think I saw an empty parking space there a few weekends ago. And, Isn't the LA River Depressing Enough As Is? SOME QUESTIONS FOR those responsible for this week's island clear-cutting in the LA River, right here in Atwater Village, arguably the greenest, friendliest portion of what is primarily a concrete storm drain. How will LA River clear-cutting affect wildlife and wildlife migration? How will clear-cutting impact the ecosystem with neighboring Griffith Park? What will it do to the local microclimate? Will Atwater Village feel hotter when there's nothing to filter sunlight reflection off the concrete and water? Why couldn't the same resources be spent on just cleaning up the trash? Will the river dwellers need more sunscreen? Neighbors are talking about it on the Atwater Village Neighborhood Council forum. The Mayberry of Los Angeles? And the Winner Is..., originally uploaded by Atwater Village Newbie. MRS. NEWBIE MUST respectfully decline to re-enter her 2007 double award-winning pink lady cookies in this year's homemade cookie contest. Partially out of fairness to the other competitors. But mostly because the rules say, "Prior winning recipes will not be accepted." Too bad for me. Sunday, June 8, 3100 Block of Glendale Blvd. To Enter: Bring your entry with the recipe no later than 11:30am to the Street Festival. Bring 12 cookies on a disposable container. Only homemade cookies made from scratch are eligible. (Not acceptable: cookies from mixes or prepared dough.) The recipe for your cookies is required. All types of baked cookies are eligible (bar, brownie, drop, molded, rolled, cut out, or refrigerator). 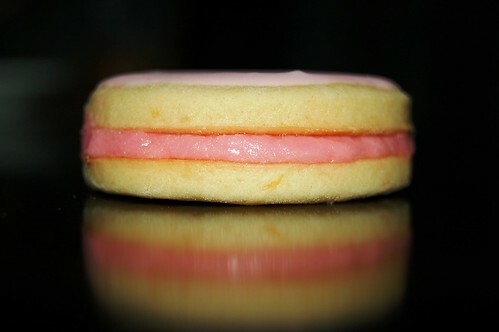 Not to overly intimidate, but last year the pink lady cookie won Best Tasting and Best Decorated. Get baking! THE MAY 6 EPISODE of The Daily Show with Jon Stewart had a funny piece about the very real Pollie Awards, the "Oscars of political consulting," taking place at the very fictitious Atwater Village Convention Center. In truth, the Pollies were held in Santa Monica. Was the made-up AVCC a mistake? Or some kind of inside joke? No matter, this Newbie appreciated it. "... I live on Hollypark Place and heard from a neighbor that a black bag or package was found lying against a house and when someone called the bomb squad showed up. I get the impression the police were concerned but not overly concerned and figured they would do everything by the book and get some real world practice. It was surreal seeing kids playing in front of me and a guy in a full on Kevlar suit to the right." Glenfeliz Blvd. - Closed, originally uploaded by Atwater Village Newbie. DRIVERS WERE DETOURED off Los Feliz Blvd. 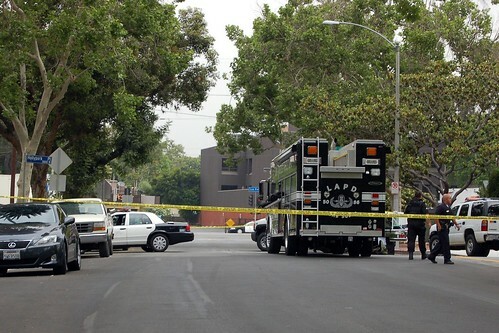 this morning into central Atwater Village, as the Los Angeles Police Department had taped off the 4-lane artery at Edenhurst Ave. They also cut off access at Glenfeliz Blvd. and Hollypark Place adjacent to Glenfeliz Elementary School. Never mind the traffic mess, as express bus routes were jammed through narrow residential streets, and Glendale Blvd. took the brunt of drivers seeking I-5. All we want to know is, what the heck was LAPD doing? And why the bomb squad truck in front of an elementary school? THIS MORNING, police tape surrounds at least a 2-block area in Atwater Village along Los Feliz Blvd., including Hollypark Place, one block south, where Glenfeliz Blvd. Elementary School is located. Anything in the news? Photos coming shortly. OF THE FEW upscale eateries in Atwater Village, the 2-year-old Asia Los Feliz (3179 Los Feliz Blvd.) was one that seemed to get better with age. At first we gave it a mixed review. But we've been back a few times, even with tourists, and each time Asia impresses. Now Asia Los Feliz is Asia Bistro. The exterior seems new - less brown, more butter - and it has a new executive chef, Joseph Chouinard, who promises a new small plate menu worthy of sharing. Anyone try it yet? What's the review? 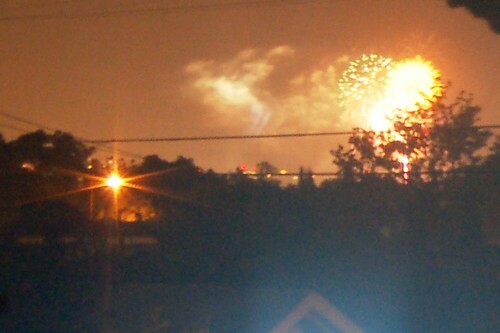 Americana Fireworks, 11:15pm, originally uploaded by Atwater Village Newbie. ATWATER VILLAGE at 11:15pm tonight got an earful of the "private" fireworks show at the Americana at Brand shopping center, 2 miles away in Glendale. The neighborhood letter promised "fireworks and musical performances staged between the hours of 7:00 p.m. and 9:30 p.m." It seems the staging has slipped a couple of hours. And so close to this weekend's grand opening! In their Disneyfication of the California shopping experience, I hope the Americana people soon realize that even Disneyland tries to wrap up the exploding light shows by 10:00pm.